Roots is a walk around tasting event and cocktail party at Strawberry Hill Farm in Stowe, featuring natural wines from Cork Wine Bar & Market, beer & cider from breweries around Stowe, heavy hors d’oeuvres from local food producers in Vermont, and a cow roast by Woodbelly Pizza. 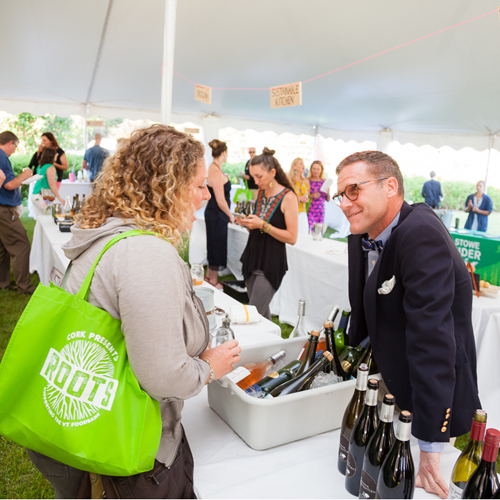 Cork, Strawberry Hill Farm, & Woodbelly Pizza present Roots 2019 on June 8th from 5-9pm. Only 300 tickets available! Early bird ticket pricing is open, so get yours before the price goes up. Tickets will not be available for purchase at the door. Roots is a walk around tasting event / cocktail party fundraiser, featuring natural wines from Cork, beer & cider from breweries around Stowe, and heavy hors d’oeuvres from the best restaurants and food producers in Vermont, plus a cow roast by Woodbelly Pizza. We are once again committed to 100% of the proceeds from the event going directly to the Vermont Foodbank's Vermonters Feeding Vermonters program. After a successful inaugural year in 2018, we seek to surpass last year's donation of $62,000 to the Foodbank. Roots is a zero waste event with no plates, cutlery, napkins or disposable cups. Each ticket holder will get a glass for drinking and a dish towel to use as a napkin. All of the garbage created at Roots 2018 fit into one small wine box! No worries! You can make a donation to the Vermont Foodbank here.